VISALIA – Hospitals need to meet California’s earthquake standards by 2030. While some hospitals managed to finance the expensive infrastructural cost through bonds, Kaweah Delta needs to find another way after the failure of Measure H last year. Now, Kaweah Delta, with input from the community, is taking steps to meet the changing health care needs of the region today and into the future. Also this month, the board will explore a partnership through creation of a Joint Powers Agreement and Joint Powers Authority (JPA) with Sierra View Medical Center in Porterville, a partnership designed to help lower the cost of health care for both hospitals and help them better care for people in the region. Both Kaweah Delta and Sierra View’s respective boards of directors will separately meet Nov. 27 to consider a partnership that could allow both entities to lower the cost of health care and further their goals of caring for people in the region. This would involve the establishment of a JPA, something that public agencies including cities, counties, schools and health care districts are allowed to do. If the hospitals move forward with this agreement, they would look for things they both currently offer independently and bring them together to provide the same service at a lower cost to each hospital. For example, they could work together on projects such as: the joint establishment of a clinic, the joint recruitment of physicians/staff, or the alignment of pharmaceutical/supply purchases. If the hospitals were to make joint purchases, both hospitals should incur the savings that come from buying in larger quantities. If both boards approve moving forward, the JPA could be operational in early 2019. JPAs allow hospitals to achieve the benefits of consolidation, while remaining independent. Under this arrangement, employees would remain with their current hospital, both hospitals would continue to be governed by separate boards and management teams, and each hospital would maintain a separate medical staff. 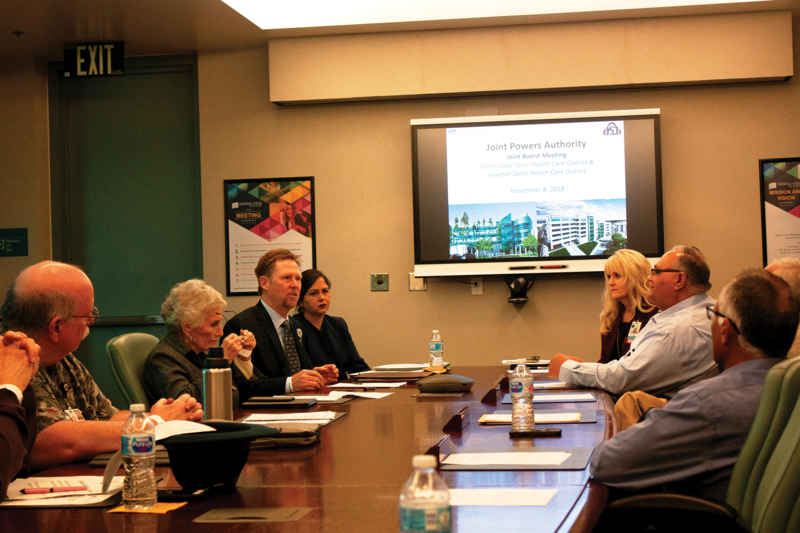 Another benefit of a JPA is that they allow for growth, so both hospitals can potentially reach out to other partners to join, said Donna Hefner, president and CEO of Sierra View Medical Center. “A partnership with Kaweah Delta is something that Sierra View has been hoping to achieve for some time. It aligns with our mission, vision and values which focuses on partnerships and collaboration. This collaboration will allow us to continue to meet the health needs and strengthen the quality of life for our community,” she said.